Sleeps 4+. 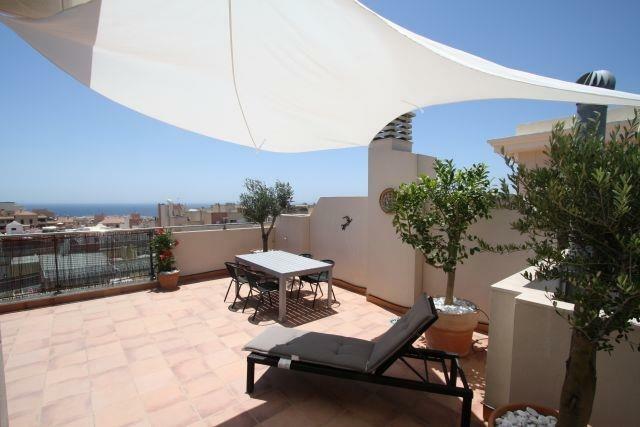 2 bedroom new penthouse apartment with very large fantastic private terrace. Brilliant sea view, also from both bedrooms, actually from both beds. 5/6 people see prices. A modern penthouse apartment with all facilities required. Close to beaches, old town, supermarkets and pharmacy. Views from roof terrace stunning and sunrise from both bedroom windows. We were here in January and it was just as good if not better than in Spring or summer. We know Nerja well and never tire of it’s charms. This apartment made our stay even better. This is the opposite side of Nerja we usually stay at so it was a nice change and we discovered lots of new very nice tapas bars . This apt. was very clean, but the kitchen is really small!! The apt is on a busy road and the noise levels can be quite high from traffic and pedestrians. Word of warning - do not park your car in the underground garage - its really tight down there!! However, the apt. is in a fantastic location, 5 mins from the Balcon and 5 mins. from the beach.